Chester Wilmot (1911–1954) was a renowned Australian war correspondent, broadcaster, journalist and writer. Covering the first triumphant North African battles of Bardia, Tobruk and Derna, the heartbreaking disaster of the Greek Campaign, the epic struggle along the famed Kokoda Track, the momentous amphibious invasion at Normandy and the eventual defeat of Nazi Germany, his voice stood above all others during BBC and ABC broadcasts throughout WWII. Following the war he continued reporting and broadcasting, and published The Struggle for Europe, his classic account of the Normandy invasion and its aftermath. He was tragically killed in the crash of the BOAC Comet over Greece in 1954, returning from Australia where he had been covering the Royal Tour. 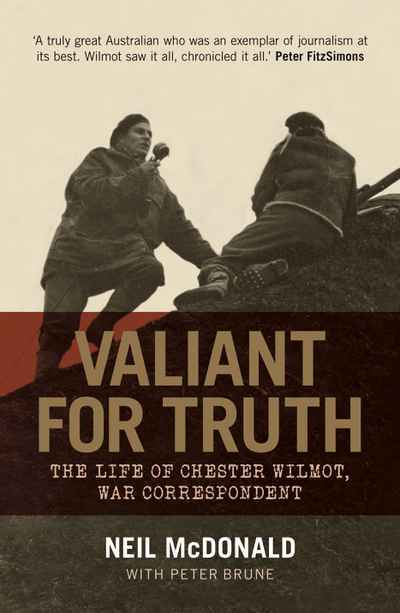 Valiant for Truth charts Wilmot’s exceptional life as he reported key events of the twentieth century. It contains the most complete account to date of the command crisis in New Guinea in 1942 and his extraordinary feud with Australian Commander-in-Chief General Sir Thomas Blamey. Bestselling authors Neil McDonald and Peter Brune unite to tell the story in this, the first full biography of one of the most important correspondents of WWII.